That is a lot of scrap wood that Rob was able to find! And you are getting a lot of work done in the garden, it looks like! That’s good that you were able to stock up on some pantry items. But, yes, produce prices seem to be going up. My week was OK. I was down with a cold and cough – still getting over that. I’m sorry you felt sick this week. Colds are so annoying–usually they are enough to make me feel miserable, but not bad enough to shut down my whole life….I hope yours leaves quickly! I’m SO sorry! That’s tough. I’m glad the workman’s comp finally agreed to pay for it, as they should, since it happened at work. I hope he recovers quickly. I’m sure there will be a lot for you to do for a while, so hang in there. Oh my! Your husband’s injury sounds awful. So glad that wc is covering it and wishing a speedy and complete recovery to him. This past Sunday my husband fell off a roof and broke his arm. He will be off work for 8 weeks. It was a good week. I pruned lots of fruit trees and bushes, and got the majority of my taxes done. I’ll be glad when I’m totally done. The weather will be warm here this week, so I plan to work more on cleaning up beds and pruning. 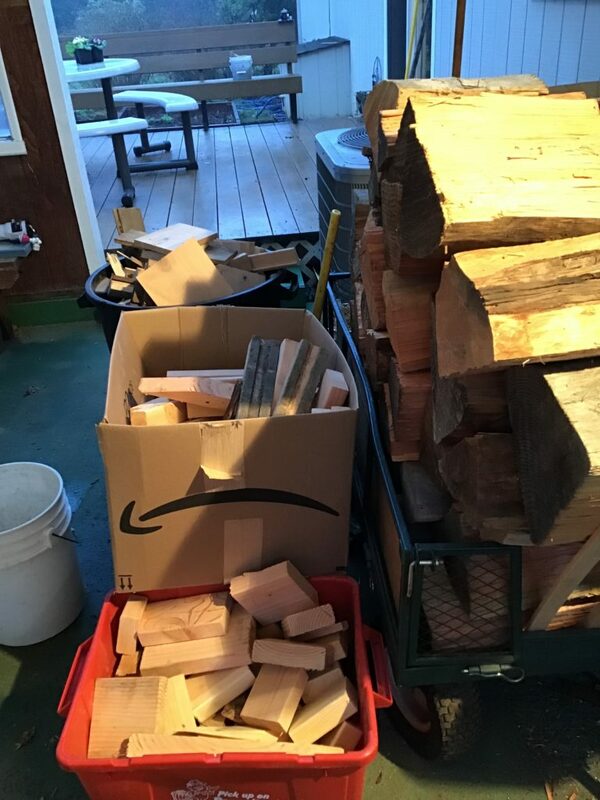 Plenty of firewood, food and library books sounds perfect for a spell of winter weather. I have SO much pruning to still do. I’m glad yours is getting done. It is very cold (for us) today, but the snow did now show up, as often happens around here. There was a small skiff of it on some cars, but I was glad to be able to do the things I needed to do early this morning. Getting the taxes done is such a relief! The prices of veggies and fruit skyrocket this time of year and the quality is horrible. I’ll be glad when my garden is producing. A friend said she planted some greens and mustards three weeks ago. Talked with her yesterday and she said everything has sprouted. Now she just has to worry about the cold weather. Her garden is on private property unlike me in the city parks/community gardens. And she has mini-hoops made out of pvc pipe and plastic over them. I can’t do that for my garden space. I’m sharing this because you could do the same in your greenhouse maybe and get some salad greens. That’s great that your friend’s greens have sprouted! I used to do some early things in my raised beds at my old house that were not possible in the big garden since it’s too wet to work in super early in the season. I’m hoping to do the same once these get going. Once, I tried the whole hoop/plastic/pvc pipe thing and it blew away in a windstorm! Maybe here, it’s more protected and would work better, OR I would certainly need to do some more studying on the proper procedures if I tried it again!I know it works for others. My grandmother used to take my Grandpa’s pants in and out depending on what size he was or going up or down. When she had expanded them he might have any kind of fabric she had on hand in a wide V on the back of his pants where she had opened up the seem and added more width. As children we found it so funny. Once summer comes around and you can go back to shorts smaller sizes will be so much easier. I think I have 6-8 sizes of jeans in my closet. One can always hope! Here in the deep south an inch of snow or even talk of snow and everything shuts down. But, it is nice to have that break at home and not feel like we have to go anywhere. Enjoy the snow if you got some! It came in the night! We have a lovely blanket of white outside our house. Even the trees are beautifully powdered with it. Rob loves to wear shorts year-round. I was teasing him yesterday, as they are so big on him that they look silly–they go down inches below his knees now, and I was teasing him that they are almost capris:). But, for now…he’s sticking to the one “new” pair of pants he got and wearing what he has. I respect that, actually, but love teasing him for such a good reason. Prior to husband falling off the roof and breaking his arm…..I had a good week and got a lot done. Just finished a massive decluttering of the whole home. I feel certain that I have single handedly stocked the charity thrift store. I used some close to date vegetables for salads and used up odds and ends of frozen fruit into smoothies. I’ve also added quite a few meatless meals to our week and that is going well. I put a roast and veggies in the oven today for supper so that I could spend time caring for hubby. I think being, lightly, snowed in for a day sounds lovely. I’m so sorry your husband fell off the roof. That’s scary! I hope he starts to feel better really soon. The one and only time I broke anything, it was my arm, and it wasn’t a bad break at all. Still, the first couple days were the worst. Hopefully, he gets over that hard stretch quickly. It sounds like you’ve done really well using things up this week. Rob is doing wonderful on his diet. I understand not wanting to buy clothes until he hits his target weight but belts only do so much. 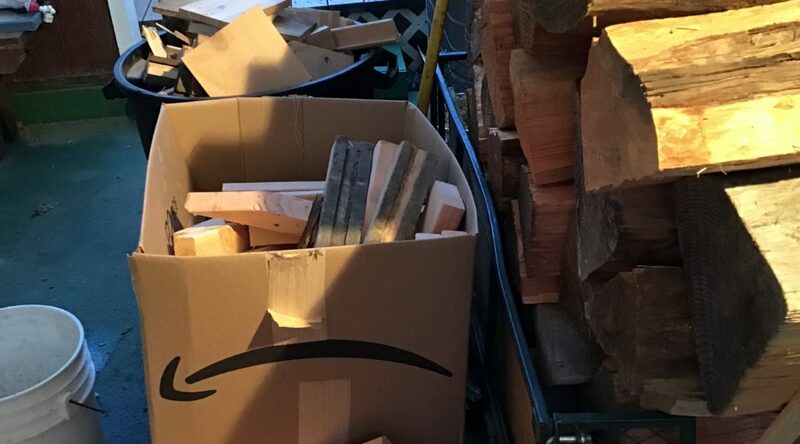 He did great on the free wood. Glad he finally got the rest of his tools. You took advantage of the nice weather. Good for you. I have been going on walks the last few days since it was in the 50’s. Last week it was 5 degrees. Crazy weather. Stay warm. It’s great that you got to go on some walks! I haven’t gotten as much exercise as I want to, since our schedule has been a little off. The snow closed the YMCA today, so I didn’t get to go to class, and once things thawed out, I had to go to work. Such is life. Good thing there’s a tomorrow, right? What a great way to utilize the wasted space between the driveway and the fence. Digging up the dirt and reusing it in the herb garden is ingenious. I wish I had some herbs by the kitchen door. 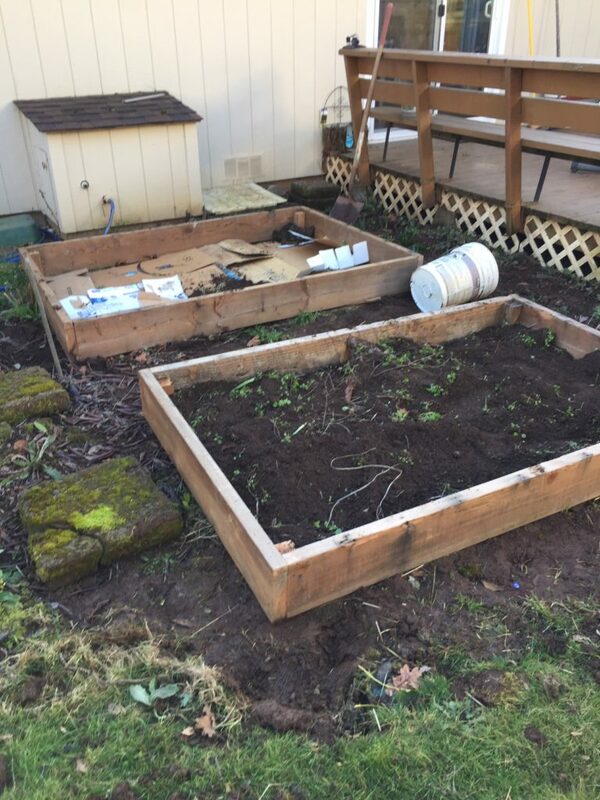 What about the area between the raised beds and the deck? 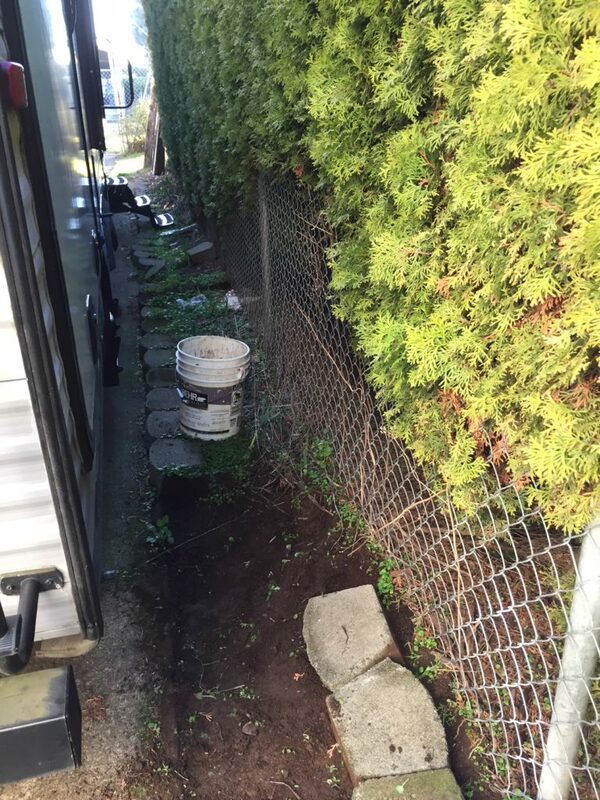 Will it be a walkway or are you going to plant something there? Is this area going to be in full sun or shade? Should I just wait for answers on your next post? Congratulations to Rob on the weight loss!!!!!!!!!!!!!! My week has been successful. We got Mom finally moved into assisted living over the weekend and then finally settled on Monday. Now I am focusing on the piles of her stuff in my basement. We have donated one load already and I have more bagged up to go. Most of my time has been spent in the front yard burning limbs from three horrible Bodock trees we had felled last week. Thorns are everywhere! Now my shade garden will become a full sun garden. I don’t know what will live. The flowerbed is a mess because the tree branches fell all over them but it was better than knocking down the powerlines. There is quite a bit of damage but it was necessary. Hiring someone to bring in big equipment and avoid the damage and cleanup would have cost about $6,000. For that amount of savings, I am willing to clean up the mess myself. I’ve never heard of a Bodock tree, except from you, and it sounds worse each time you mention it. I’m glad you chopped them down. The project of cleaning out your Mom’s stuff could not have been easy, so I’m glad you are making progress on it. I’m glad you found a good place for her to live that is closer to you. Right next to the deck, bulbs are planted. So, I moved some coral bell plants that were right where I wanted the raised beds over behind the daffodils and tulips. There will be deck, coral bells, daffodils and bluebells and tulips in season, then a bit of gravel to walk on around the raised beds, then some stepping stones on the far end so the faucet can still be easily reached. At one end, there are a couple of chrysanthemums and a couple of Columbine. There will be a step down from the deck to the raised bed area so herbs can be picked without getting my shoes dirty when things are wet. The other bed will have strawberries and early crops. That’s the plan, anyway. I’ve got a ways to go before it’s a reality, especially since it has been snowing the past few days, off and on, and I’ve had to stop this project for a while. The bed will have sun for most of the day in the summer, but will be shaded by the house part of the day. Still, it will be better than where I have berries now, I think, and herbs aren’t fussy. I will also leave some herbs over where they are, next to the garden, if I think it will take over (mint) or will be too big for the area, or if I want lots to dry (my 1000 parsley plants) and focus on things like basil, cilantro, chives, a small bunch of parsley, etc. right near the kitchen in the new raised beds. I enjoyed every word of your description and could see the plan of your garden in my mind. It will be enjoyable watching it grow and change. Thank you for explaining. Is there anything vining that will be growing up the deck railing? PS: Bodock trees are really awful and the more I pick up the truckloads of thorns in the front yard, the worse my opinion of the trees becomes. Honestly, that name, Bodock tree sounds like something out of a bad science fiction movie. I’m glad they are going, going, gone!